What follows is the Fatwa (religious verdict/ruling) of one of the Sunni world’s most revered scholars, Shaikh Mahmood Shaltoot with regard to the Shi’a. Shaikh Shaltoot was the head of the renowned al-Azhar Theological school in Egypt, one of the main centers of Sunni scholarship in the world. It should be of interest to know that a few decades ago, a group of Sunni and Shi’a scholars formed a center at al-Azhar by the name of "Dar al-Taqreeb al-Madhahib al-Islamiyyah”which translates into "Center for bringing together the various Islamic schools of thought". The aim of the effort, as the name of the center indicates, was to bridge the gap between the various schools of thought, and bring about a mutual respect, understanding and appreciation of each school’s contributions to the development of Islamic Jurisprudence, among the scholars of the different schools, so that they may in turn guide their followers toward the ultimate goal of unity, and of clinging to one rope, as the well-known Qur’anic verse, "Hold fast to the Rope of Allah and do not diverge”clearly demands of Muslims. For the readership’s reference the phrase "al-Shi’a al-Imamiyyah al-Ithna ‘Ashariyyah”means the Twelver Imami Shi’ite School of thought which comprises the overwhelming majority of Shi’ites today. The phrase "Twelver Shi’ites”is used interchangeably with "Ja’fari Shi’ites”and "Imami Shi’ites”in various literature. They are merely different names for the same school of thought. "al-Shi’a al-Zaidiyyah”are a minority among the Shi’ites, concentrated mainly in Yemen located in the Eastern part of Arabian peninsula. For a more detailed description of the Zaidis vs. the Twelver Shi’ites, please refer to the book, "Shi’ite Islam”written by the great Shi’ite scholar, Allamah Tabataba’i, and translated by Seyyed Hossein Nasr, and published by the State University of New York Press (SUNY). 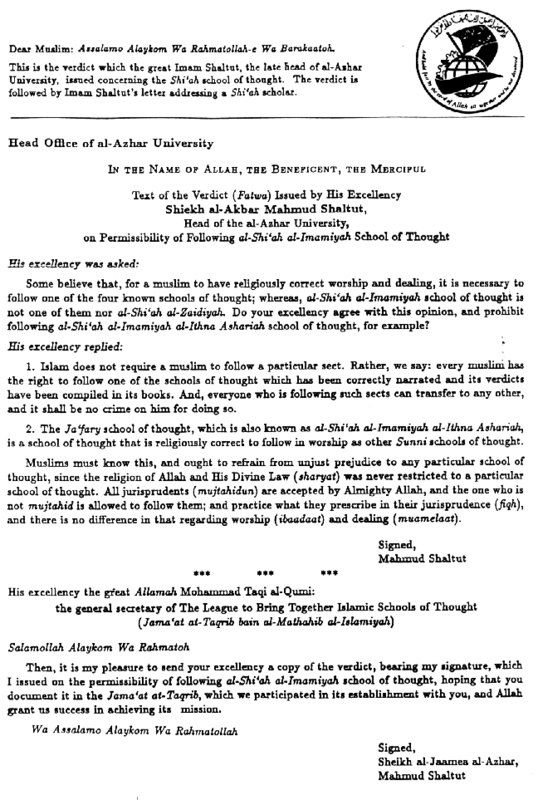 Some believe that, for a Muslim to have religiously correct worship and dealing, it is necessary to follow one of the four known schools of thought, whereas, "al-Shi’a al-Imamiyyah”school of thought is not one of them nor "al-Shi’a al-Zaidiyyah.”Do your Excellency agree with this opinion, and prohibit following "al-Shi’a al-Imamiyyah al-Ithna Ashariyyah”school of thought, for example? 2) The Ja’fari school of thought, which is also known as "al-Shi’a al- Imamiyyah al-Ithna Ashariyyah”(i.e., The Twelver Imami Shi’ites) is a school of thought that is religiously correct to follow in worship as are other Sunni schools of thought. Muslims must know this, and ought to refrain from unjust prejudice to any particular school of thought, since the religion of Allah and His Divine Law (Shari’ah) was never restricted to a particular school of thought. Their jurists (Mujtahidoon) are accepted by Almighty Allah, and it is permissible to the "non-Mujtahid”to follow them and to accord with their teaching whether in worship (Ibadaat) or transactions (Mu’amilaat). 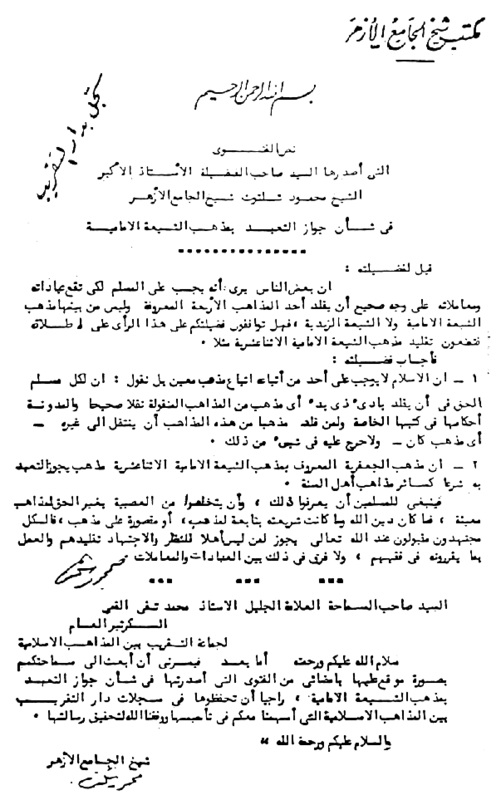 1. al-Sha’ab newspaper (Egypt), issue of July 7, 1959. The above segment can also be found in the book "Inquiries about Islam", by Muhammad Jawad Chirri, Director of the Islamic Center of America, 1986 Detroit, Michigan.